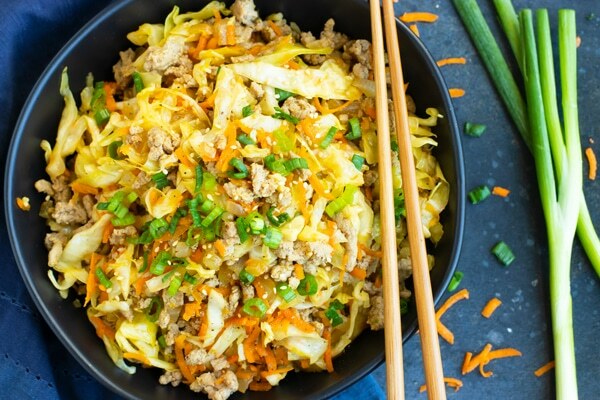 Egg Roll in a Bowl Recipe - Ready in 30 Minutes! 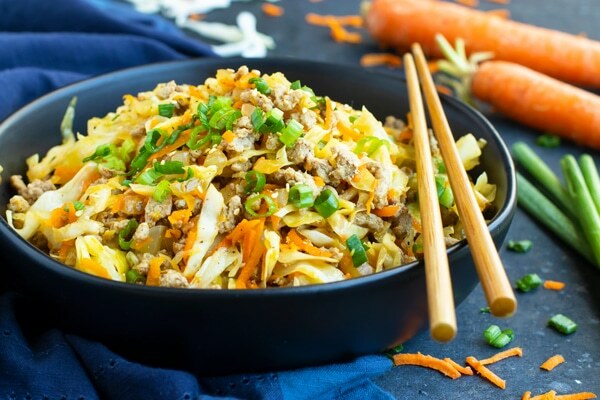 This Egg Roll in a Bowl recipe is loaded with Asian flavor and is a Paleo, Whole30, gluten-free, dairy-free and keto recipe to make for an easy weeknight dinner. From start to finish, you can have this healthy and low-carb dinner recipe ready in under 30 minutes! Every now and then I will make a recipe and I know it is a success within the first 24 hours. I promise I’m not being cocky. There is a method to my madness to prove this theory. How exactly do I know? Cohl and I wage leftover war against each other and fight to the egg roll in a bowl finish. Cabbage is flying around as we elbow our way to the refrigerator for one last bite. Ok, I’m getting a little dramatic here, but for real… these egg roll in a bowl leftovers caused quite the stir. Not to mention this simple recipe actually tasted BETTER with time! All of the delightful Asian flavors melded together in a harmonious medley of low-carb egg roll-y bliss. So what was my solution to this leftover war? 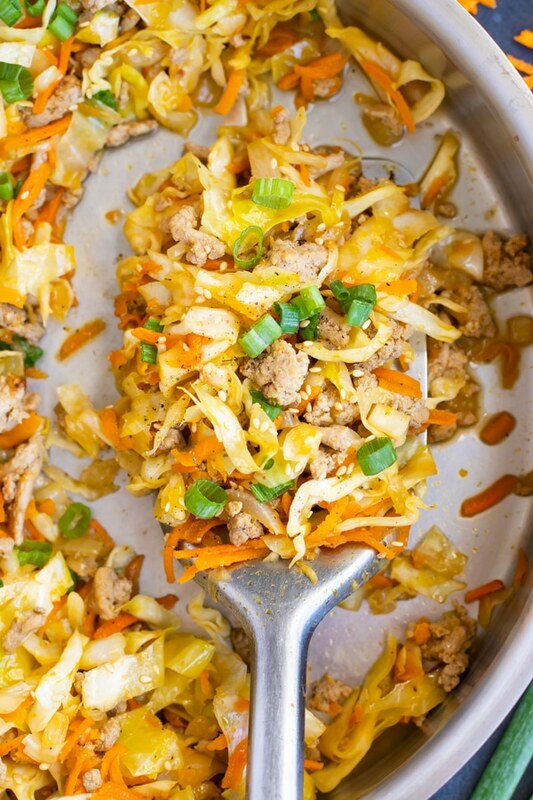 Make another batch of this egg roll in a bowl recipe… because it takes less than 30 minutes!! Who needs the egg roll wrapper when you have all of the goodness that’s inside of the egg roll in one enormous bowl? I don’t know about you, but I sure do feel crummy after eating an egg roll. Maybe it’s the grease the egg roll is fried in or the gluten-filled wrapper. But did you know all of the ingredients INSIDE of the egg roll are actually pretty good for you? 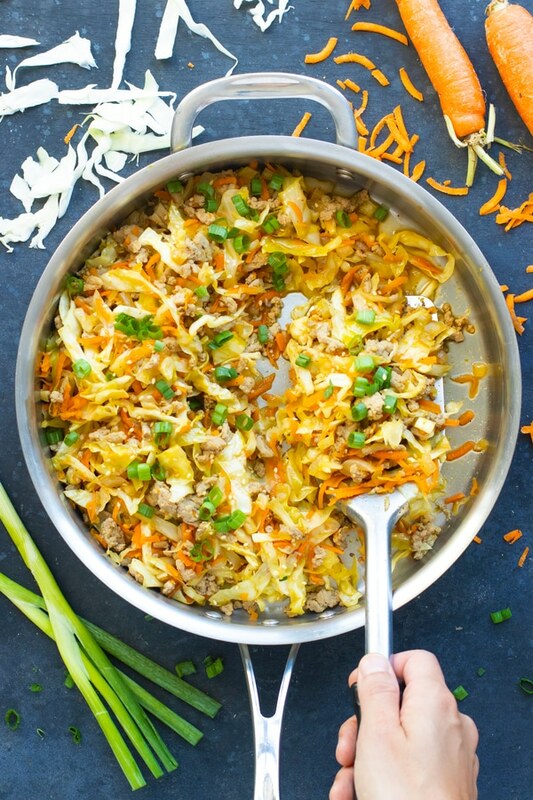 So let’s take all of those nutritious ingredients out, toss ’em around in a skillet, and make an egg roll in a bowl! So what exactly are those nutritious ingredients inside of an egg roll? Pork: eh! Ok, not super healthy, but we actually use a lean ground turkey in this recipe instead! Cabbage: Did you know that the large majority of an egg roll is made up of cabbage? Carrots: Oh yes, an egg roll in a bowl would not be complete without this nutritional powerhouse. Ginger + garlic: the traditional, and albeit necessary, flavors that pack an anti-inflammatory punch. Soy sauce: to make this recipe Whole30, Paleo and keto friendly we use liquid coconut aminos, instead! How Can You Evolve this Egg Roll in a Bowl Recipe? Feel free to use different varieties of cabbage. Ground beef, turkey, or pork all work great in the recipe. If you’re not on a Paleo, keto, or Whole30 diet you can use regular gluten-free soy sauce or Tamari instead. Load it up with even MORE vegetables. Chinese broccoli, zucchini, and squash would taste great in here, too. 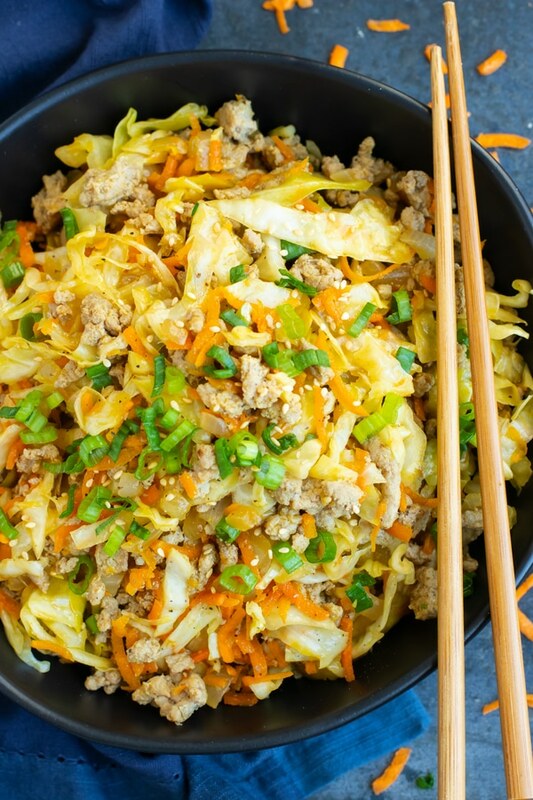 Want more recipes like this Egg Roll in a Bowl? In a large saute pan over medium heat drizzle 1 tablespoon olive oil and add ground turkey. Cook for 5-6 minutes, or until turkey is almost cooked through. Push turkey to the side of the pan and add onion and other tablespoon of oil. Saute for 3-4 minutes. 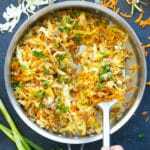 Add shredded carrots, garlic, and ginger and saute for 2 minutes. Stir the vegetables and turkey together. Pour chicken broth in the pan and scrape the bottom of it to deglaze it. Add cabbage, coconut aminos or soy sauce, vinegar, salt, and pepper. Stir well and cover with a lid. Reduce heat to medium-low and cook for 12-15 minutes, or until cabbage is to your desired tenderness. *Coconut liquid aminos are Paleo and Whole30 compliant, but soy sauce and Tamari are not. **If on a keto diet, leave out the carrots for 10 grams carbs / 7 grams net carbs per serving. Hi there! Do you think this recipe would work with scrambled eggs as a meat substitute? Hi Elizabeth!! They might! I would probably try ground tofu (“tofurky”) for the most similar results. Would love to know how it turns out!! This was delicious! I didn’t use meat and added mushrooms. Thank you for this recipe! Oh I love that idea, Pam!! What a creative way to make the dish vegetarian. Thanks so much for the comment and rating!! Absolutely delicious. Very easy to make. Hi Linda! So happy you enjoyed it 🙂 Thanks so much for your comment!! 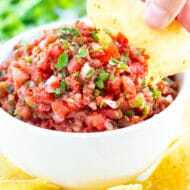 Just made this delicious recipe and shared it with friends!!! It’s a must!!! Def going in my weekly meal preps. WooHoo!! So happy you enjoyed it, Brandy! Thanks so much for your comment and rating!! We made this tonight and it was a huge hit! My semi-picky husband and toddler both ate and loved this! Yum!! Do you have an Instagram? I would love to follow and tag you in the post I’d like to do on it. So yummy! Thanks for sharing! Hi Sandra! I have not personally used that but it sounds delicious. I bet it will taste great in the recipe! Would love to know how it turns out for you! Yay!! So so happy you all enjoyed it. Thanks so much for the comment and rating!! That’s awesome, Candace! So happy you and the family loved it! I loved this, and was skeptical at first. I used ground chicken and I browned it well in the cast iron. I also used low sodium tamari instead of coconut aminos and found it needed a bit more that what the recipe called for. This Will definitely go on the rotation. Also a huge bonus this can be used for leftovers as well. Hi Heather! Love that you used ground chicken. And yes, it’s GREAT for leftovers!! Thanks so much for your comment! As mentioned in the notes, if you leave out the carrots it drops the carb count down to 10 grams/7 net per serving. I don’t eat meat so I used textured protein and this is sooo delish!!! That was a great idea, Teresa!! Thanks so much for letting me know and for your comment and rating! Not to bad. Very easy to make. This is so good! The whole family liked it. Yay!! So happy you and the hubby enjoy it. Thanks for the comment! I used ground pork and a broccoli slaw mix (cause I’m lazy) and some additional cabbage. It really hit that Chinese food spot that I’ve been craving!! Yay!! So happy you enjoyed it, Michelle! I love your ideas to make it even quicker and easier! Thanks for your comment and rating. Very tasty! I am keeping this recipe for a go to healthy choice. I love love love this receipt I already made it twice in a week! I love how the flavors come together and you can indulge guilt free! Hi Ginger!! I am SO happy you enjoy the recipe so much. Thanks for your comment! I made this recipe, I really like it! I am sure I will modify it at some point…….but as written, it is fantastic! That’s awesome, Brian! So happy you enjoyed it. Thanks for your comment! Made this tonight and it was delicious. Thanks for sharing the recipe. I made this tonight and it was so good! I doubled the sauce because I just like a lot of flavor. Will definitely make this again! Thanks! LOVE, LOVE, LOVE this recipe. Can hardly wait to make this again. Thanks so much for sharing. Yay, Barbara!! I am SO happy you enjoyed it so much. Thanks for your comment and rating! Sweet baby geezus this was soooo much better than I expected. Only adjustment I made is that I added a little more toasted sesame oil. Great recipe! A little extra sesame oil was probably delicious, Jackie!! Thanks for the comment and rating!! The reviews on this recipe are spot on. 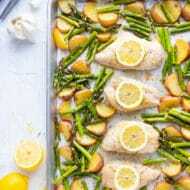 This dish is quick, easy and most importantly, DELISH! Going on the regular menu rotation. Thanks for a great recipe! This is delish! 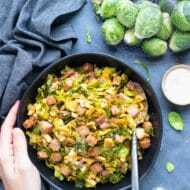 I just used two bags of shredded cabbage with a few strips of carrots in it which made a perfect Keto dish. We all enjoyed this! Wow, Best super healthy thing I’ve eaten in a long time! I used turkey sausage since that is what I had and added a small dash of Korean BBQ sauce. It is amazing. Do you drain the juice from the meat prior to adding the onions ?? Hi Amber! Great question. It totally depends on how much juice you have and how lean/fat your meat is. If it looks like a lot, drain it and add back 2 tablespoons. Let me know how it turns out for you! This was so delicious, I can eat this every day!! Thanks!! This was delicious! I added diced green pepper and I also added a couple scrambled eggs to it. I do think for me it was a bit to salty. I think next time I’ll leave out the additional salt as I feel like you get enough salty flavor from the aminos (or soy sauce depending on what you use) otherwise SO tasty! It seems pretty adaptable and would be very good with lots of other veggies too! Would probably be pretty good with some red chili flakes too kick it up a knot he with some heat! We will be adding this to our regular rotation for sure! I am curious what you consider 1 serving? I try and track everything I eat and appreciate the notional facts already put together but would love to know what constitutes 1 serving. Thanks for the fantastic recipe! Those additions sound delicious, Sara! And yes, it can totally get a little salty depending on the coconut aminos/soy sauce brand you use. I do not know the exact measurement for 1 serving. I generally divide it up in the pan by eyeballing it, or you can weigh the entire pan and divide it up by weight. Thank you for your comment and rating! Hi! Do you think I can used ground ginger instead of fresh ginger? Hi Flora! Yes, you absolutely can. It won’t have quite the same taste, but will be very similar. I would try using a pinch to 1/8 teaspoon ground ginger. Can’t wait to hear what you think! 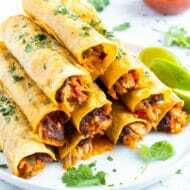 This is one of my favorite recipes and leftovers heat up perfect! 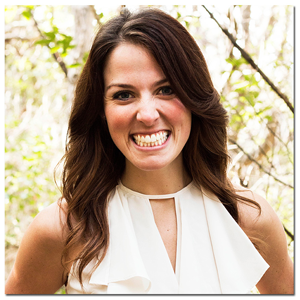 So happy to hear that Kimberlee! And yes, leftovers are the best!! Thanks for your comment and rating! I made this tonight for dinner and myself and my husband really liked it. The only change was 1/2 lb mild Italian sausage and 1/2 lb ground turkey. Very good! Served with brown rice. I made this tonight with ground turkey and it was delicious. This will definitely be a regular meal on our table. Thank you so much for sharing. We are trying to reduce carbs in our diets and this recipe did that. The name of this recipe is perfect too. Tastes exactly like eggrolls. Hi Terry! 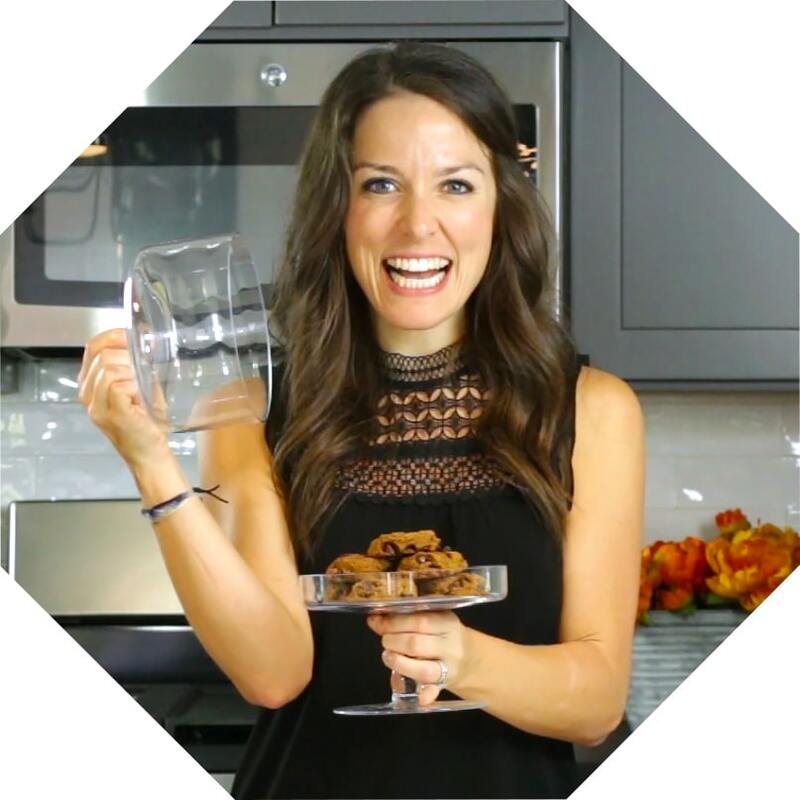 So happy you enjoyed the recipe so much and that it will become a new regular in your rotation. Thank you for your comment!